IBM® i integration with BladeCenter® and System x™ allows businesses to operate heterogeneous environments that include Intel®-compatible servers running VMware® ESX Server in addition to core business applications on the IBM i platform. VMware ESX Server is the host server for abstracting processor, memory, storage and networking resources of a physical server into multiple virtual machines. The ESX Server is part of the VMware Infrastructure. 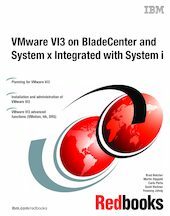 Implementing VMware Infrastructure 3 with System i® integration with BladeCenter and System x brings together the strengths of System i along with the benefits that VMware Infrastructure 3 brings to the BladeCenter and System x.